If you are looking for something different for your Kids Birthday Party or to keep the kids amused at a Wedding Reception, then Crazy Golf Hire have the answer you are looking for – Crazy Golf which is Fun, Challenging and Educational. 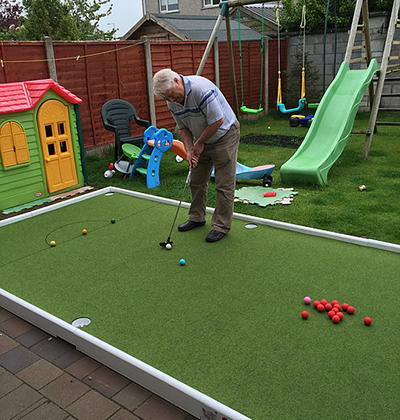 Crazy Golf is fun for young and old alike. Children can play on their own, while parents watch from the sidelines keep score, or the whole family can play together. This is a fully portable, flexible mini golf course. It can be used indoors or outdoors, and can be customised to fit your needs. This is a fully portable, flexible mini golf course that can be used indoors or outdoors, and can be customised to fit your or your company needs. 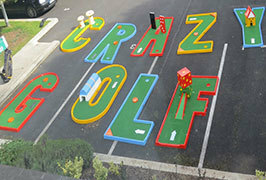 Crazy Golf Hire will come to you and set up the crazy golf course – everything is included: course, clubs, balls, obstacles and scorecards. The Crazy Golf is transportable and the equipment is weather proof, so your course can be inside our out on any relatively flat surface. Excellent for events with limited budget and/or limited space. Booking:- Crazy Mini Golf Hire custom built 9 hole portable crazy golf course is perfect for any occasion just call today on 086 8100119 and they will look after you. They will travel to any part of the country. Comes complete with putters, golf balls and score cards. Crazy Golf Hire price includes setup and removal. For safety they use non bounce golf balls and the golf putters have rubber heads. 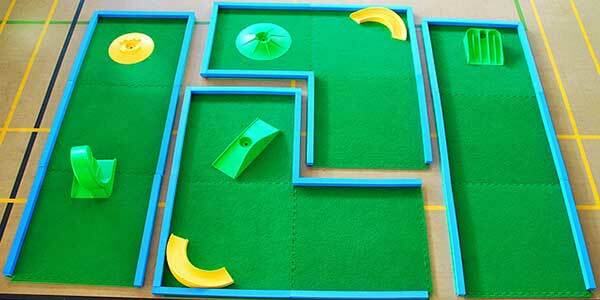 Crazy Golf Hire have four sizes of golf putters, Children’s, Teenagers and Adult Sizes. The latest offering from Crazy Golf Hire! The new small course is ideal for smaller areas (and budgets). This is a very versatile course, it can be set up as a four hole set, 1 long putt, or endless design options! 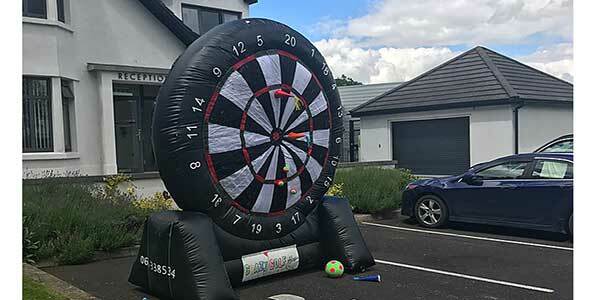 This Giant Inflatable Dart Board version of the game stands at just over 10ft wide and 12ft tall! Scoring is exactly the same the normal game. The board is supplied with clubs , teeing mat and velcro golf balls. Although the dart board it much bigger, this is still a tricky game to play! Great fun for kids and adults alike. Ideal for all types of events and can be used indoors or out. This unique snooker golf course is a 14’ X 7’ floor laid table complete with balls and clubs for snooker and pool. Simply, it’s snooker but with golf putters and balls! Because of it’s compact size it is ideal for smaller outdoor or indoor areas. Total space required is approx 200 sq ft and is also completely weather proof. 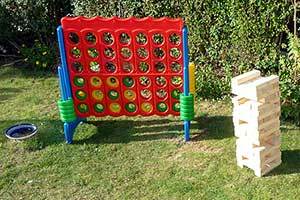 Crazy Mini Golf Hire also have a selection of garden games! 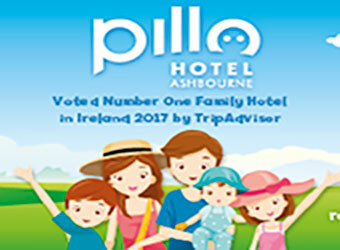 Children and adults love playing with the giant garden games as the whole family have the opportunity to get involved. The rang includes 4 in a Line, Giant Jenga (High Tower, Stacking Tower) and a hardwood Ladder Golf game. These games are also perfect for any event as they can be used as an activity game at an Family Fun Day, Activity Day or as a filler in between other activities. 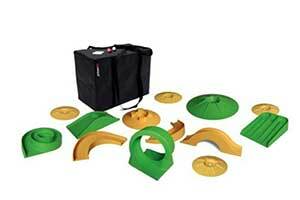 The Crazy Golf Hire Garden Games are suitable for both indoor and outdoors use. Very little space required and quick to set up. 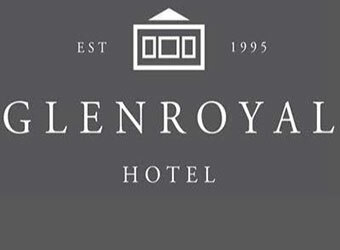 Book now for your private or corporate event. 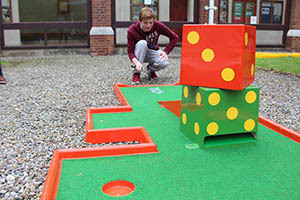 Having CrazyGolf Hire set up on our site for a team-building session was a real bonus. Cutting out on travel meant we maximised our enjoyment of the afternoon. Tee off was at 1.30pm and we played until the trophy was lifted after an intense playoff-round late in the afternoon! Thanks to the CrazyGolf Hire team for a quality product and service and we look forward to a Castlecabin Crazy Golf series in 2016. 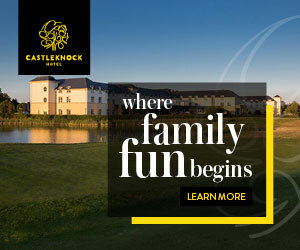 Limerick Racecourse booked Crazy Golf for our family fun day on the busy Munster National raceday on the 11th of October. This was the first time we used crazy golf and it went down a treat with both children and parents on the day. 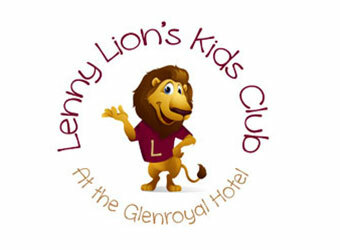 We always strive to give our families variety of entertainment on racedays and the crazy golf did not disappoint with great feedback from race goers delighted with the fun the children enjoyed with it. 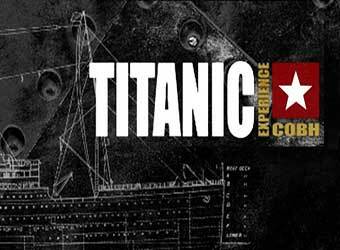 We have booked it again for our next family fun day on the 29th of December too! I just wanted to drop you an email to thank you for your help to make our Launch event a huge success! I was delighted at the feedback the Crazy Golf received from our guests. It was great to have something unusual and entertaining that was set up and broken down in no time. Throughout the day adults and kids had a lot of fun on the course and I will certainly be recommending it to others and looking forward to having you back with us in Curraghchase next season! I would just like to state that we had the pleasure of working alongside crazygolfhire.ie as a Day Time Activity for students within St Patricks College Drumcondra for our Freshers Week. They were a pleasure to work alongside, the activity was very well received with high participation levels and we look forward to working alongside them again for our RAG week in the new year.